^ Space Race Rekindled? Russia Shoots for Moon, Mars. ABC News. 2007-09-02 [2007-09-02]. ^ Hamilton, Calvin. Mars Introduction. ^ Elert, Glenn. Temperature on the Surface of Mars. ^ NASA Confirms Evidence That Liquid Water Flows on Today’s Mars. ^ MARIE reports and data 互联网档案馆的存檔，存档日期2010-05-30. ^ Zubrin, Robert. The Case for Mars: The Plan to Settle the Red Planet and Why We Must. Touchstone. 1996: 114–116. ISBN 0-684-83550-9. ^ 16.0 16.1 16.2 Space Radiation Hinders NASA’s Mars Ambitions. ^ Flight to Mars: How Long? And along what path?. Phy6.org. [2013-08-01]. ^ 20.0 20.1 Zubrin, Robert. The Case for Mars: The Plan to Settle the Red Planet and Why We Must. Touchstone. 1996. ISBN 0-684-83550-9. ^ NASA: Space radiation between Earth and Mars poses a hazard to astronauts. ^ Dr. David R. Williams. Mars Fact Sheet. NASA Goddard Space Flight Center. 2004-09-01 [2007-09-18]. ^ Nancy Atkinson. The Mars Landing Approach: Getting Large Payloads to the Surface of the Red Planet. 2007-07-17 [2007-09-18]. ^ Gangale, T. MarsSat: Assured Communication with Mars. Annals of the New York Academy of Sciences. 2005, 1065: 296–310. Bibcode:2005NYASA1065..296G. PMID 16510416. doi:10.1196/annals.1370.007. ^ 存档副本 (PDF). [2013-10-06]. （原始内容 (PDF)存档于2013-09-27）. ^ A Novel Interplanetary Communications Relay (PDF). [February 14, 2011]. ^ Landis, Geoffrey A. Meteoritic steel as a construction resource on Mars. Acta Astronautica. 2009, 64 (2–3): 183. doi:10.1016/j.actaastro.2008.07.011. ^ Effect of Clouds and Pollution on Insolation. [2012-10-04]. ^ Fogg, Martyn J. The utility of geothermal energy on Mars (PDF). Journal of the British Interplanetary Society. 1997, 49: 403–22. Bibcode:1997JBIS...50..187F. ^ G. E. Cushing, T. N. Titus, J. J. Wynne1, P. R. Christensen. THEMIS Observes Possible Cave Skylights on Mars (PDF). [June 18, 2010]. ^ http://mars-one.com/ Mars One - Initiative for establishing a fully operational permanent human colony on Mars by 2023. ^ 馬斯克研超級火箭 2024火星殖民 - 20170930 - 國際 - 國際要聞. 明報新聞網 - 每日明報 daily news. [2017-10-16] （中文（台灣）‎）. ^ D. Kaplan et al., THE MARS IN-SITU-PROPELLANT-PRODUCTION PRECURSOR (MIP) FLIGHT DEMONSTRATION, paper presented at Mars 2001: Integrated Science in Preparation for Sample Return and Human Exploration, Lunar and Planetary Institute, Oct. 2-4 1999, Houston, TX. 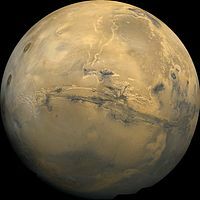 ^ G. A. Landis, P. Jenkins, D. Scheiman, and C. Baraona, "MATE and DART: An Instrument Package for Characterizing Solar Energy and Atmospheric Dust on Mars", presented at Concepts and Approaches for Mars Exploration, July 18–20, 2000 Houston, Texas.